First day in Marrakech we ended up at Restaurant Chez Chegrouni, by the Djemaa el Fna. 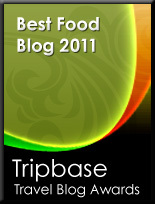 It was a recommended choice in our guidebook described as a place with good food at low prices. We agree! 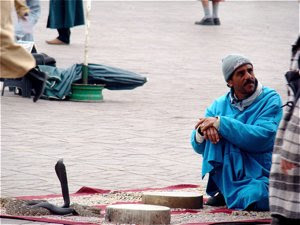 It is difficult to find a place with a better location in Marrakech. Located by the city's main square you are right where everything happens. Here you can eat as you can follow what goes on. 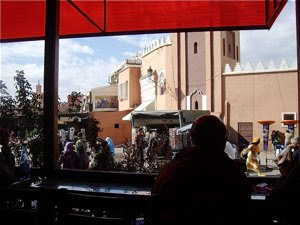 Restaurant Chez Chegrouni is within walking distance of all the sights of the Medina. If you look for a place with personalized service, Restaurant Chez Chegrouni is definitely not the place for you. Orders were taken and food served with not as much as a grin. We did not have to wait long to get food on the table. Restaurant Chez Chegrouni had an interior as a cross between a French bistro and a traditional Moroccan tavern. Outside you were seated on a terrace with tables along side the railing with a direct view to the square, or by the the inner wall of the terrace. The inside of the restaurant was decorated with colourful Moroccan tiles. The tables and benches were in dark wood, and quite dirty, we discovered. The waiter cleaned it up before we were served, but I had a suspicion that hygiene was not sufficiently taken care of. I also found the seating uncomfortable as there was little room between the tables, as the terrace was filled up to capacity with people. 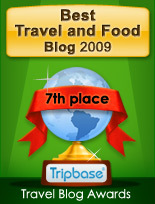 The food was decent and very inexpensive. Chez Chegrouni is definitely worth a visit for those of you traveling on a budget. I ordered a harira soup and a couscous with chicken. We got a basket with delicious , freshly baked bread before the meal. 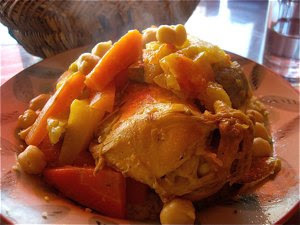 The harira soup is a traditional Moroccan soup usually served during Ramadan or at special occations as e.g. weddings. 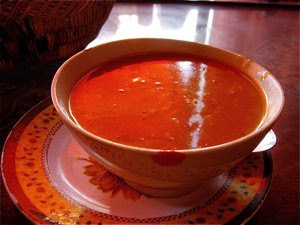 The harira was a brightly coloured soup from tomatoes and saffron, often used in this traditional dish. It was a great dish with many complex aromas. Our harira was a tomato based soup with sweet and slightly bitter contrasting flavours provided by a wide range of spices, with additional heat from ground chili, most probably harissa paste. There were vegetables, a little meat and beaten eggs had been added to the soup. 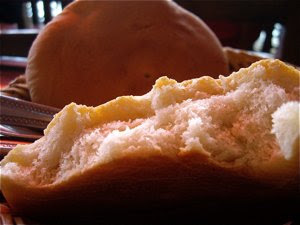 We had harira three times, and the one found at Chez Chegrouni was the best of the three. Couscous are one out of two main groups of food to order when visiting Morocco. Couscous are small granules made by rolling and shaping moistened semolina wheat and then coating them with finely ground wheat flour. Couscous is served with lamb, chicken, or vegetables. The couscous dishes are often mild, and very suitable for those of you that do not like strongly spiced foods. I was served a heap of couscous with half a chicken and boiled vegetables on a brightly coloured traditional plate. The skin of the chicken had been rubbed with traditional spices and possibly preserved lemon. Except from this, our couscous with simply flavoured by home made broth. It was a filling dish, chicken extremely tender, vegetables a little over cooked (a way to prepare vegetables my mother would have approved of). The couscous was deliciously tender. The chicken couscous at Chez Chegrouni was absolutely worth its price. I would have loved a cold beer to my chicken, but as we were in a Muslim country, there were only soft drinks available. I chose regular mineral water, not a bad choice on a hot North African winter's day. 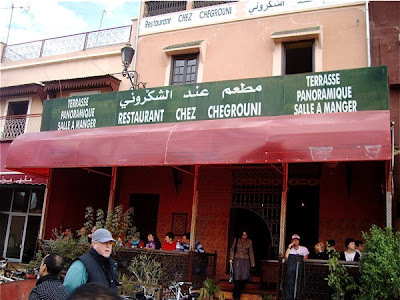 Excellent location and inexpensive, honest food at Restaurant Chez Chegrouni. The place was however filled to capacity, and it felt a little cramped on the terrace. Dirty on the outside tables.